I have to admit straight up that I wasn;t convinced about whether the apparent incredible engineering that has gone in to the Pro Click 1.6 from Razer Pro Solutions would make any difference to how my mouse would work. The two weeks I’ve spent in experiencing the Pro Click has transformed my beliefs behind what a difference in having a high performance sensor will do to your mouse. At $59.99 this mouse translates to about £30 here in the UK, which in comparison to offerings from Logitech and Microsoft isn;t that much of a price premium to pay for what you get. Some of you however may be wondering why you should spend so much on a mouse. 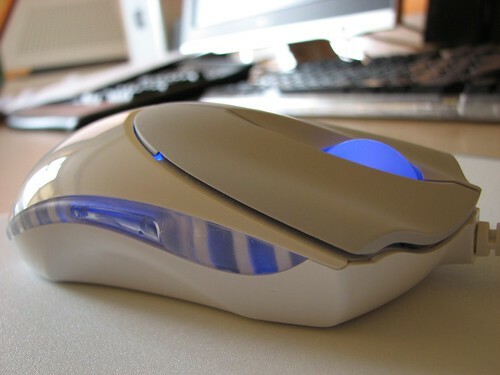 Well, carry on reading before you make your decision because after the first 30 seconds of using this mouse I was hooked! 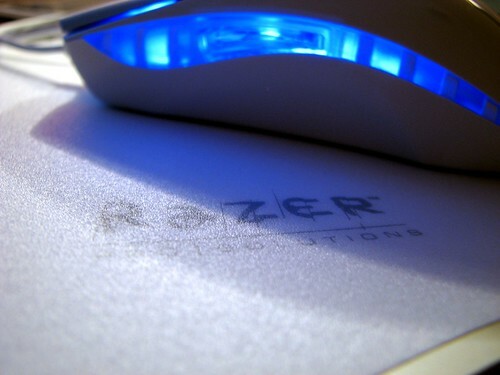 So lets talk about the spec of the Pro Click 1.6 mouse from Razer Pro Solutions. Featuring a 1600dpi sensor, 5.8 mega pixels per second bandwidth, 6400 frames per second, zero acoustic Teflon feet, 7 programmable buttons, always on mode, 16-bit data path, gold plated USB connector and 7 foot cord. All this translates in to a super smooth ‘mousing’ experience so you can glide right across your desk with this highly engineered mouse. These are the main points of the Pro Click and it aims to deliver a unique and superior experience over other brands of mice that tout there gaming or pro capabilities. 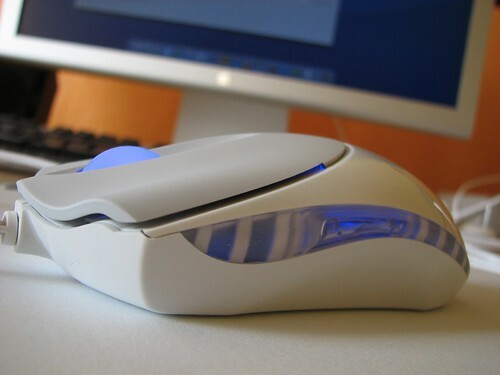 This mouse simply glides over any surface. It’ really smooth, the response and feedback you get when you’re rolling this mouse either over the Razer Pro – Pro Pad or just on your desk, the movement is delightfully gorgeous. The large rubber non-slip buttons with a nice tactile response means that you can get comfortable with this mouse no matter what ‘mouse’ background you’ve come from. Comfort and suitability is the absolute critical factor for any computer user. If it doesn’t sit right in your hand then it’s no good. 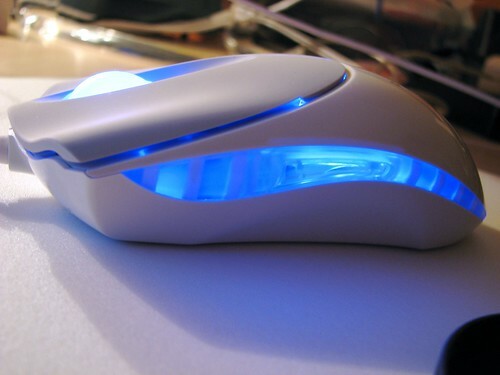 The comfort factor played a huge role for me in deciding whether I liked this mouse or not. The large left and right click buttons are great because I can comfortably rest my hand on the mouse and just click without moving my fingers or having to make adjustments. The scroll wheel in the middle has a tiered level scroll so you get a response from each time you scroll it. This is unlike other mice that have a smooth response and this is usually not the best response for gamers. Reason for this? First person shooters are probably the prime example where a smooth scroll wheel isn’t preferred. The middle scroll wheel is often used to switch weapons or select options. So a response each time you scroll enables the user to know how fast or hard to scroll. If they just want to get the next weapon, you just scroll it down one notch. If you want to scroll fast then you still have that ability. You don’t get that ability on a mouse with a smooth scroll. At the left and right sides of the mouse you’ll discover four shortcut keys. Two on each side and are barely visible to the naked eye. The two buttons on the left are positioned exactly right for your thumb to press either one. These are easily accessible and can be programmed to do a number of tasks such as scroll up and down windows. The shortcut buttons on the right hand side don’t offer the same level of accessibility for obvious reasons. That is if you’re left handed. Whilst these buttons are there and can be used even if you are right handed, I guess they’re there for those who want to use this mouse left handed and still have the two shortcut keys under the thumb. In terms of looks, the Pro Click certainly looks the part. 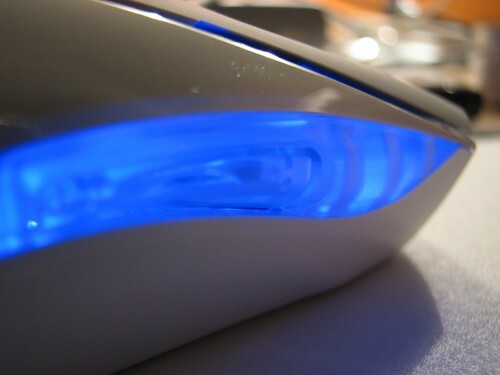 A soft blue glow emanates from the middle scroll wheel and the see-through sides and since this is a laser mouse, the underside doesn’t emit any glow or light. The design fits in with the whole iPod generation of products and as a mouse designed for the Mac, it will certainly appeal to Mac users. I’ve been using it with my MacBook Pro and it’s been an aesthetically and ergonomically pleasing experience. The specification of this mouse is quite mind-boggling and to be honest will be confusing for people looking at it. So much so that Razer Pro have an FAQ page detailing connection speed/baud rates, the encoder DPI as well as in depth technical details about the drivers and how they work. If anything, all this technical data and painstaking research that has clearly gone in to developing this product has paid of, and Razer Pro demonstrate that they certainly know a thing or two about how a mouse works. The Razer Pro – Pro Click 1.6 gets the TechCast Recommended Award. If you’re looking for a mouse and prepared to stump for the $59.99/Â£30 price then look no further because Razer Pro have the perfect mouse on the market today.